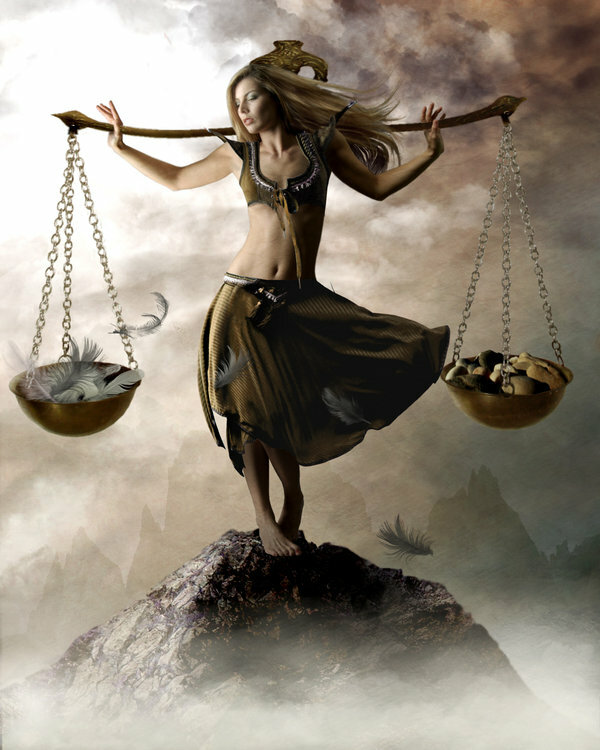 Libra is symbolised by the scales of balance & justice. The more balanced we are in our attitudes, the more we can enjoy partaking moderately in everything but nothing in excess which leads to imbalance, distortion & suffering. Ruled by Venus, Libra asks us to refine our thoughts so our words create beauty and inspire co-operation rather than words that cut others down because they’re motivated by the fears & torment of an undisciplined mind. Libra is an air sign. In the Tarot it’s portrayed by the suit of swords, representing the the double-edged sword of the mind. When we discipline our lower mind, our considered words have the power to pierce illusions so truth can free others from paranoid fears & delusions. Alternatively when we speak without thinking, our words can cut deep and dissect what was a functioning cohesive whole into fractured shards. Libra reminds us restore beauty through changing our perspective & grace through the power of word so we can transcend being enslaved by the critical mind. Libra tempers the opposite sign of Aries. So if the recent full moon in Aries caused inner conflict due to the actions of others disrupting plans to co-create, this new moon provides an opportunity to heal polarisation & external conflict by considering the feelings & needs of others so mutually beneficial outcomes can be achieved. It is this awareness of other that creates the conditions for fairness so justice prevails without the need for intervention from an external authority. Libra asks us to mature psychologically by tasting of the ‘dark fruits’ of the zodiac wheel, the 6 signs of the Underworld that start with the sign of Libra. Why? Relationships ask us to grow up! Without this maturity we unwittingly create war & separation and destroy that which offers opportunities for love & peace. Justice is a huge theme during a Libra transit so this week as we approach both sun & moon in Libra at new moon we will ponder situations that feel unjust or unfair. If our conscience is not keeping us accountable for our actions, this is a time when others will. In the Tarot card of Justice the soul learns our choices have consequences. This is how we learn how to make better choices. The more fairly we treat others, the more fairly we are treated in return. The lesson of Justice reminds us of the long-term consequences our decisions will have. If we’re stuck in our rational mind, evaluating the pros & cons to make a decision we can become paralysed to act. Just like the sword of truth that appears in the justice card we need to transcend the over-analysis of the rational mind & discern right action through attuning to our intuition, the innate knowing of our higher mind that strikes the heart. Pluto Square Sun & Moon: Better the Devil You Know! This is certainly a time of intense transformation in the relationship realm! Why? Pluto, went direct Oct 2 & is stationary for most of Oct amplifying the Plutonian powers of this small but deadly planetoid. Pluto was also known as Hades, Lord of the Underworld. So coming ready or not we will be confronted with the shadow play we enact in the realm of relationships. For example, we may repeatedly destroy that which we love or fall for unavailable partners who offer pain instead of love. Through seeing our dark side & taking responsibility for it we have the opportunity to grow beyond it & leave the darkness of our self-created Hell. Further intensifying this we have Venus in Scorpio which is ruled by Pluto! So our current challenge is to own our unhealed issues that play out in our personal interactions. How? By acknowledging them. This brings what’s in the shadow of denial into the light. Once confronted with this truth we must take right action & be accountable for what we’ve done. This restores the savles of justice to a balanced position. Only when we do this do we dismantle power struggles that destroy the trust & safety needed for love and beauty to thrive. Fortunately we have 5 planets in cardinal signs this new moon signifying a huge new beginning in our relationship sector. So now is the time for radical change – by identifying those who are capable of being fair & honourable & those who are not. And with Saturn forming a harmonious trine to Uranus we’re given A Ha! moments of self-awareness that we can ground with practical application. This entry was posted in Uncategorized and tagged balance and justice, love, Tanishka, the Peacemaker. Bookmark the permalink.